This CellML model runs in both OpenCell and COR to recreate the published results. The model is valid CellML, and the units have been checked and they are consistent. This version of the model is for a healthy heart. Chronic exposure of adult rats to a simulated altitude of 4500 meters is accompanied by right ventricular hypertrophy which is, at least, partially attributable to an enlargement of right ventricular myocytes. This work contributes to the understanding of cardiovascular system modifications induced by changes in the atmospheric environment. Hypertrophied myocytes show an important increase in action potential duration, particularly at the delayed phase of the repolarisation. Although it is well known that Ito and ICaL are decreased in hypertrophied rats, we hypothesized that the Na+/Ca2+ exchange current could be implied in the prolongation of action potential duration in hypertrophied cells. The electrophysiological study of myocytes was achieved using the whole cell configuration of the patch clamp technique. This configuration was obtained in two ways: the conventional broken patch technique, which allows to control the internal medium composition and to buffer the intracellular calcium, and the perforated patch technique which allows to respect the internal composition of each cell. In order to test for the implication of Na+/Ca2+ exchange current, we compared the action potentials obtained in control and in hypertrophied cells, in ionic conditions where the Na+/Ca2+ exchanger was either present or blocked. The Na+/Ca2+ exchanger current measured in voltage clamp conditions was also compared in control and hypertrophied cells. Our results clearly show and implication of Na+/Ca2+ exchanger current in the prolongation of action potentials recorded in hypertrophied cells. Concerning the underlying mechanisms, the voltage clamp experiments show that the increased exchanger current is induced by a modification of the driving force for the exchanger rather than by a modification of “conductance” or density of Na+/Ca2+ exchanger proteins. 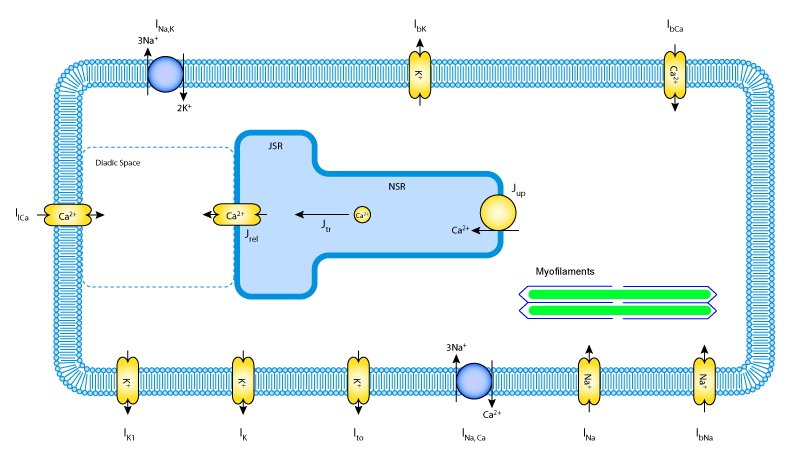 The modification of the driving force could be induced by a change in the regulation of calcium concentration by the sarcoplasmic reticulum or by the action potential duration itself. The experimental data acquired in this study, were used in a mathematical simulation of the action potential (Oxsoft Heart model). One of the most interesting result obtained by this method is the high implication of a persistent sodium current in the hypertrophied cell action potentials. A schematic diagram of the cell described by the model. L'Echange Na+ /Ca2+ dans l'Hypertrophie Ventriculaire D'Altitude chez le Rat: Etude Electrophysiologique et Utilisation du Modele "Oxsoft Heart", Leon Espinosa, 1998. Derived from workspace Espinosa, 1998 at changeset 46bb541ea697.